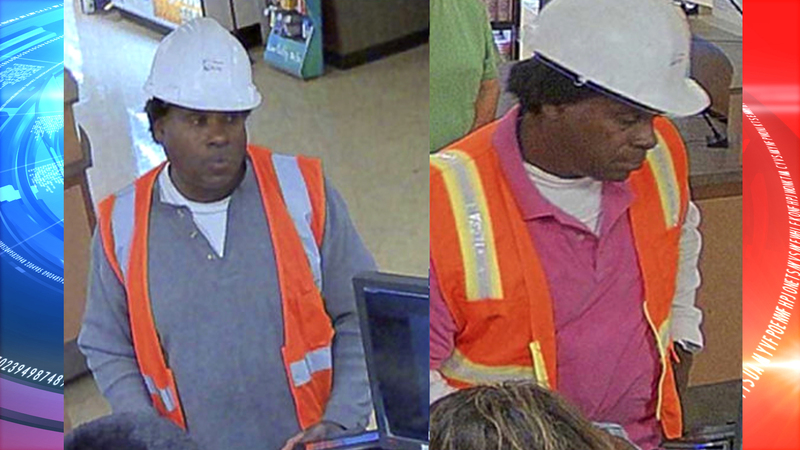 SAN DIEGO, CA – San Diego police are asking for the public’s help in finding a man suspected in a series of area burglaries. Police said the 10 break-ins happened between January and May of this year in Mira Mesa, Rancho Bernardo and Poway. The suspected thief, who police said has worn a construction worker disguise in the break-ins, entered the homes by breaking the rear sliding glass doors. Once inside, police said the man would go into the master bedrooms and steal items such as jewelry, cash and high-end purses. According to police, in one burglary, the man stole 30 federal savings bonds that he later cashed at banks in Vista and Oceanside. A bank surveillance camera captured a photo of the man cashing a stolen savings bond while in disguise. Anyone with information on the cases or the suspected thief is urged to call SDPD’s Northeastern Division at 858-538-8047 or Crime Stoppers at 888-580-8477. Crime Stoppers is offering a reward of up to $1,000 for information that leads to an arrest.